The Larson Electronics EPF-10P.3-NFK Explosion Proof Electric Inline Axial Fan Class 1, Division 1 and Class 2, Division 1 listed and safely and effectively redirects stale air from hazardous location areas. This fan is designed for portability, and can be linked in series when larger lengths of conductive duct are needed. This explosion proof fan delivers high-performance airflow with a 1,390 overall CFM rating and 973 CFM when fitted with a 25ft. duct and a 90 degree bend. 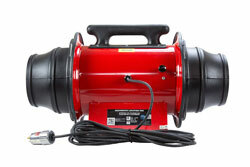 The 1/3 horsepower electric motor runs from standard 115 VAC single-phase at 60Hz and pulls 2.5 amps. Added safety features include a prewired explosion proof switch, dual grounding lugs on the steel housing, and 10 feet of cord fitted with flying leads. 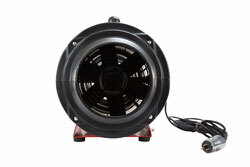 Meets United States and Canadian safety ratings for Class 1, Division 1, Groups C and D & Class II Division 1, Groups E, F and G.
This explosion proof fan is designed for portability and durability with a light weight compact body constructed of powder coated steel and a non-sparking aluminum blower wheel. Rubber coated base feet and an integral carry handle provide easy transport and secure placement when set down on a flat surface. This unit is available with either an 8 inch or 10 inch intake and exhaust flange, and includes a built in automatic reset thermal overload for added protection. Ambient temperature for the fan ranges from -20 degrees to 180 degrees Fahrenheit. • 973 cfm when a 25ft. duct and a 90 degree bend are present while in use. • 72 dbA @ 3ft.